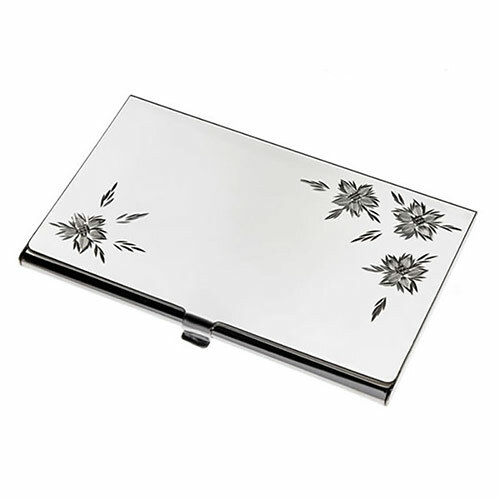 These superb business card holders have a fine quality silver plated finish and feature a distinctive floral pattern diamond cut into the hinged lid. Crafted by one of England's finest silversmiths, these stylish card cases hold 10-12 standard business cards and they slip easily into a purse, pocket or handbag. The sturdy metal frame ensures that your business cards are always crisp and pristine, while the distinctive design and immaculate finish makes a clear statement about your professionalism and attention to detail. As corporate gifts or luxury promotional items, these card cases are sure to provide both an instant 'wow' factor and a long-lasting branding benefit. They can be engraved on the lid, and they are offered here with free engraving of both text and logos. 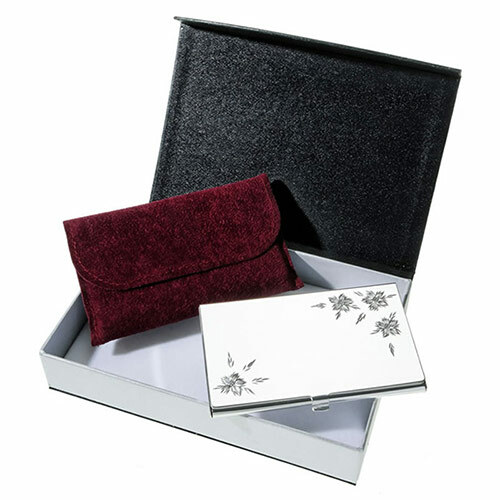 The card cases are supplied complete with a deluxe black and silver coloured presentation box with hinged lid and padded cloth lining.